Human CMV (HCMV) infection promotes a variable and persistent expansion of functionally mature NKG2Cbright NK cells. We analyzed NKG2Cbright NK cell responses triggered by Abs from HCMV+ sera against HCMV-infected MRC5 fibroblasts. Specific Abs promoted the degranulation (i.e., CD107a expression) and the production of cytokines (TNF-α and IFN-γ) by a significant fraction of NK cells, exceeding the low natural cytotoxicity against HCMV-infected targets. NK cell–mediated Ab-dependent cell-mediated cytotoxicity was limited by viral Ag availability and HLA class I expression on infected cells early postinfection and increased at late stages, overcoming viral immunoevasion strategies. Moreover, the presence of specific IgG triggered the activation of NK cells against Ab-opsonized cell-free HCMV virions. As compared with NKG2A+ NK cells, a significant proportion of NKG2Cbright NK cells was FcεR γ-chain defective and highly responsive to Ab-driven activation, being particularly efficient in the production of antiviral cytokines, mainly TNF-α. Remarkably, the expansion of NKG2Cbright NK cells in HCMV+ subjects was related to the overall magnitude of TNF-α and IFN-γ cytokine secretion upon Ab-dependent and -independent activation. We show the power and sensitivity of the anti-HCMV response resulting from the cooperation between specific Abs and the NKG2Cbright NK-cell subset. Furthermore, we disclose the proinflammatory potential of NKG2Cbright NK cells, a variable that could influence the individual responses to other pathogens and tumors. Human CMV (HCMV) is a β-herpesvirus that infects 40–100% of adult populations worldwide, depending on socioeconomic factors (1). In most immunocompetent individuals, primary infection is clinically silent and the virus establishes a chronic infection alternating cycles of latency and subclinical reactivations. However, immunocompromised hosts (i.e., hematopoietic and organ transplant recipients, AIDS patients) are at risk for development of severe HCMV disease. HCMV is the leading cause of congenital infection in the developed world, and can result in mental retardation and deafness (2–4). In addition, HCMV has been related to the development of atherosclerosis and immunosenescence (5, 6). Control of HCMV involves multiple immune resources, with a prominent role for IFNs, and the combined action of NK cells, T cells, and Abs. NK cells are cytotoxic lymphocytes capable of killing virus-infected cells without prior sensitization. They also secrete cytokines (i.e., IFN-γ, TNF-α), which mediate a noncytolytic control of the virus, contributing to induce Th1 protective-specific responses (7, 8). Activation of NK cells is tightly controlled by the balance between inhibitory and activating receptors (9). Among them, KIR, CD94/NKG2A, and LILRB1 are specific for HLA class I (HLA-I) molecules and prevent NK cell activation against healthy host cells (10, 11). During HCMV replication a set of viral proteins (i.e., US2, US3, US6, US10, US11) inhibit surface expression of HLA-I in infected cells (12). To counteract the resulting susceptibility to NK cell recognition, the virus has developed a variety of strategies for evading NK cell function (13, 14). HCMV infection induces to a variable extent the stable expansion of NKG2Cbright NK cells, a differentiated and functionally mature NK cell subset hallmarked by elevated expression of the CD94/NKG2C activating receptor in the absence of its inhibitory counterpart NKG2A (15). NKG2Cbright NK cells display low levels of NKp30 and NKp46, and preferentially express inhibitory KIR specific for self–HLA-C (15–17). Recently, HCMV infection has been associated with the expansion of FcεRγ-chain–defective NK cells and also with the appearance of NKG2C− oligoclonal NK cell subpopulations expressing activating KIR, which further illustrate the pressure exerted by this β-herpesvirus on the host NK cell compartment (16, 18, 19). The molecular mechanisms driving the HCMV-dependent NK cell differentiation remain unknown. The development of HCMV-induced NKG2Cbright NK cells is observed following the primary infection early in life, in intrauterus-infected newborns and upon HCMV reactivation in immunosuppressed hosts such as hematopoietic and solid organ transplant patients (20–23). 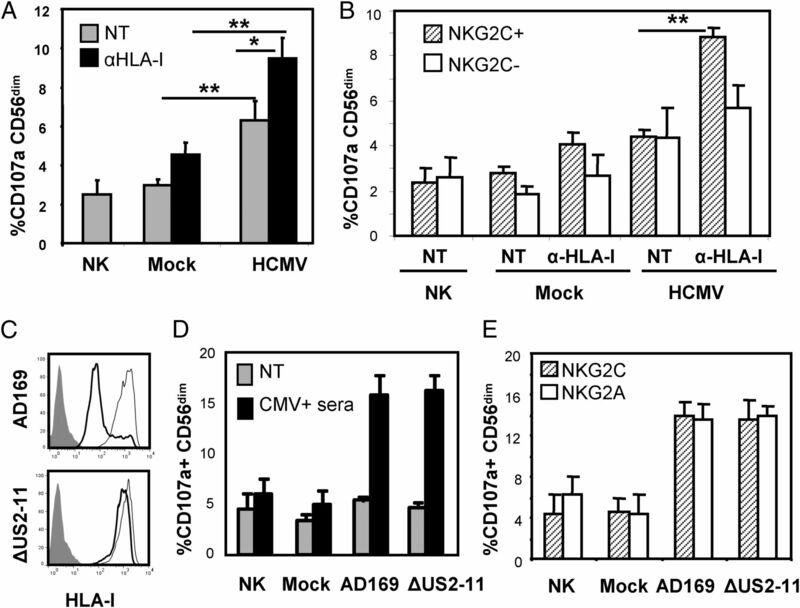 HCMV-induced NKG2C+ NK cells resemble the Ly49H+ NK cell subset in murine CMV infection, which, through specific recognition of the viral MHC-I–like m157 protein, contribute to viral clearance and persist in the circulation conferring protection to subsequent murine CMV exposures (24–26). Currently, the participation of NKG2Cbright NK cells on the anti-HCMV response is circumstantially supported by the observation of a NKG2C+ NK cell lymphocytosis concomitant to the reduction of viremia during acute infection of a T cell–immunodeficient infant (27). In vitro, NKG2Cbright NK cells display a moderate response against HCMV-infected cells, although a recent study disclosed their possible role as Ab-dependent effectors (28, 29), in close resemblance with FcεRγ-chain–deficient NK cells (19). The CD16A (FcγRIIIA) receptor, present on most CD56dim NK cells is, together with NKG2D, preserved upon NKG2Cbright NK cell differentiation (30). CD16 interacts with the Fc portion of a cell-bound IgG molecule, promoting target cell killing and cytokine production by resting NK cells, in contrast with the simultaneous coengagement of at least two receptors required by other activating NKRs (31, 32). Information on NK cell–mediated Ab-dependent cell-mediated cytotoxicity (ADCC) in HCMV infection is scarce. In this study, we have systematically characterized the contribution of NKG2Cbright NK cells and HCMV-specific Abs to the recognition of infected cells and virions. Our results reveal the power and sensitivity of this antiviral mechanism resulting from the synergism between both arms of the immune system, and uncover the contribution of NKG2Cbright NK cells to Ab-mediated anti-HCMV responses by secreting proinflammatory cytokines. PBMCs, NK cells, and serum samples used in this study were obtained from volunteer healthy adults. Written informed consent was obtained from every donor, and the study protocol was approved by the local ethics committee (Clinical Research Ethics Committee, Parc de Salut Mar n°2010/3766/I). FACS analysis was performed using mAbs specific for the following surface molecules: CD56-allophycocyanin, TNF-α–FITC (eBioscience, San Diego, CA), NKG2C-PE (clone 134591) and unlabeled-NKG2C (clone MAB1381; R&D Systems, Minneapolis, MN), CD94/NKG2A-PE (Beckman Coulter), CD3-PerCP, IFN-γ–PE, Perforin-FITC, and CD107a-FITC (BD Biosciences Pharmingen, San Diego, CA), anti-FcεRI Ab, γ subunit-FITC (Merck, Millipore). mAb anti-CD16 (clone KD1) and anti–HLA-I (clone W6/32), anti-NKG2A (clone Z199), anti-KIR2DL2/S2/L3 (clone CHL, kindly provided by Dr. S. Ferrini, National Institute for Cancer Research, Genova, Italy), and anti-KIR3DL1 (clone DX9, kindly provided by Dr. L.L. Lanier, University of California, San Francisco, CA) were produced in the laboratory and indirectly labeled. mAb anti-KIR2DL1 (clone DM-1) was produced and characterized in our laboratory. Cells were pretreated with human aggregated IgG (10 μg/ml) to block FcRs and were subsequently labeled with specific Abs. For indirect immunostaining, samples were incubated with unlabeled Abs followed by PE-conjugated F(ab′)2 polyclonal rabbit anti-mouse IgG+IgM (Jackson Immunoresearch, West Grove, PA) or PE-Cy7–conjugated F(ab′)2 polyclonal goat antimouse IgG (Biolegend, San Diego, CA). Depending on the assays, samples were analyzed in a FACSCalibur or LSR II flow cytometer (BD Biosciences), and data were analyzed with FlowJo software (TreeStar). For blocking experiments, the anti–HLA-I A6/136 (kindly provided by Prof. A. Moretta, University of Genova, Genova, Italy) was used at saturating concentrations. MRC5 fetal human lung fibroblasts cell line (HLA-A*02,*29, HLA-B*07,*44, HLA-C*05,*07) was obtained from the American Type Culture Collection (Manassas, VA) and grown in DMEM supplemented with 10% FCS, 2 mM l-glutamine, penicillin, and streptomycin. Purified stocks of HCMV AD169 strain and HB5-derived mutant HB5-ΔUS2-11 (15) were prepared by infecting MRC5 cells at 0.1 multiplicity of infection (MOI) and harvesting supernatants when maximum cytopathic effect was reached. Cells and debris were removed from virus containing supernatant by centrifugation and stored at −80°C. Viral stocks were titrated by plaque assays on MRC5 cells analyzed by detection of the viral IE-1/IE-2 Ag with a mouse anti-CMV mAb (clone mab810; Millipore) by immunofluorescence. Inactivation of viral stocks was achieved by UV light using a UV cross-linker (Biorad GS genelinker UV chamber) at 300 mJ for 10 m.
MRC5 cells were incubated alone (mock), with AD169 or HB5-ΔUS2-11 strains (MOI 0.7), or with the same concentration of UV-inactivated virus for 2 h and then washed with PBS and maintained in DMEM supplemented with 3% FBS. If not specified, infected MRC5 cells were cultured for 48 h until used in functional assays. For the labeling of viral Ags, HCMV-infected or UV-HCMV–treated MRC5 cells were pretreated with rabbit serum (30 μl) to block FcRs, and incubated with affinity purified human IgG for 30 min at 4°C followed, after washing, by PE-conjugated anti-human Ig (Jackson Immunoresearch Laboratories). PBMCs were obtained from heparinized blood samples by separation on Ficoll-Hypaque gradient (Lymphoprep; Axis-Shield PoC AS, Oslo, Norway). Serum samples were collected and heat-inactivated before storage at −20°C. Standard clinical diagnostic tests were used to analyze serum samples for circulating IgG Abs against HCMV. Unless noted in the Results, PBMCs were always kept overnight with complete RPMI 1640 medium supplemented with IL-2 (200 U/ml) before functional assays. In some experiments, PBMCs were left untreated or incubated with IL-15 (10 ng/ml) overnight. NK cell purification was performed by negative selection using EasySep Human NK Cell Enrichment kit (StemCell Technologies, Grenoble, France) according to the manufacturer’s recommendations. Unless noted in the text, all functional assays were performed with NK cell samples from HCMV-seropositive blood donors with NKG2Cbright NK cell expansions (described in Supplemental Table I). NK cell degranulation was monitored by the CD107a mobilization assay. Purified NK cells were incubated alone or together with mock-treated, HCMV-infected, or UV-HCMV–treated MRC5 cells (4:1 E:T ratio) for 4 h at 37°C in the presence of monensin (5 μg/ml; Sigma-Aldrich) and CD107a-FITC. In some conditions, 2–10% of heat-inactivated sera from HCMV-seropositive or -seronegative donors was added to the coculture. Cells were then stained with anti–CD56-allophycocyanin, anti–NKG2C-PE, or anti–NKG2A-PE, and analyzed by flow cytometry. Rituximab-coated 721.221 cells, a HLA-I–deficient B lymphoblastoid cell line, were used as positive control. For intracellular cytokine staining, PBMCs or purified NK cells were cultured alone or with target cells in the same conditions described earlier in the presence of monensin (5 μg/ml; Sigma-Aldrich) and brefeldin A (10 μg/ml; Sigma-Aldrich) for 4 or 18 h. Subsequently, cells were indirectly stained with anti-NKG2C and PE-Cy7–conjugated F(ab′)2 polyclonal goat anti-mouse IgG followed by anti–CD3-PerCP and anti–CD56-allophycocyanin. Cells were fixed and permeabilized with fixation/permeabilization kit (BD Biosciences), stained with anti–TNF-α–FITC and anti–IFN-γ–PE, and analyzed by flow cytometry. In some experiments, purified NK cells were treated with PMA (2 ng/ml) and Ionomycin (0.5 μg/ml). For virion sensing experiments, PBMCs or purified NK cells were incubated with HCMV virions (1–2.5 infective particles/cell) in the presence of sera from seropositive or seronegative donors for 4 or 18 h at 37°C. NK cell TNF-α and IFN-γ secretion was measured by ELISA (eBioscience). Purified NK cells were cultured alone or with rituximab-coated 721.221 for 24 h. Cell-free culture supernatants were harvested, and IFN-γ and TNF-α concentrations were measured by ELISA as recommended by the manufacturer. FCGR3A 158V/F polymorphisms was determined using a PCR with confronting two-pair primers, as previously described (33). Recent studies have proposed the specialization of HCMV-induced FcεR γ-chain–deficient and NKG2C+ NK cells as Ab-dependent effectors (19, 29). To address the possible relationship between both NK cell subsets, we characterized the expression of CD16, FcεR γ-chain, granzyme B, Perforin, and HLA-C– and HLA-B–specific inhibitory KIR (KIR2DL1, KIR2DL2/S2/L3, KIR3DL1) in NKG2C+ and NKG2A+ CD56dim NK cells by multiparametric flow cytometry, in a cohort of HCMV+ healthy volunteers displaying significant expansions of HCMV-induced NKG2Cbright NK cells (donor description is shown in Supplemental Table I). According to the definition of NKG2Cbright NK cells, all donors presented a discrete NK cell subpopulation displaying increased surface levels of NKG2C in the absence of NKG2A (Fig. 1A) (30). Expression of CD16 (FcγRIIIA) was similar in all CD56dim NK cells, whereas the expression of the FcεRγ-chain was decreased in a variable proportion of NKG2Cbright but hardly in any NKG2A+ NK cells (Fig. 1A–C). NKG2Cbright NK cells showed comparable perforin and greater granzyme B levels compared with NKG2A+ NK cells (Fig. 1D). In agreement with previous studies, an elevated proportion of NKG2C+ NK cells coexpressed inhibitory KIR2D specific for self–HLA-C and lacked the HLA-B–specific KIR3DL1 (Fig. 1E and Supplemental Table I) (16, 21). Thus, the NKG2Cbright NK cell subset included FcεRγ-chain–defective NK cells and gathered unique features that might influence their effector potential upon Ab-driven activation. Phenotypic comparison of ADCC-related features of NKG2Cbright and NKG2A+ NK cell subsets. Expression of FcεR γ-chain, CD16, granzyme B, Perforin, KIR2DL1, KIR2DL2/L3, and KIR3DL1 was analyzed in NKG2C+ and NKG2A+ NK cells by multiparametric flow cytometry on PBMCs from HCMV+ healthy donors with NKG2Cbright expansions. (A) Coexpression of both lectin-like NKRs with FcεR γ-chain in CD56dim cells from two representative donors. 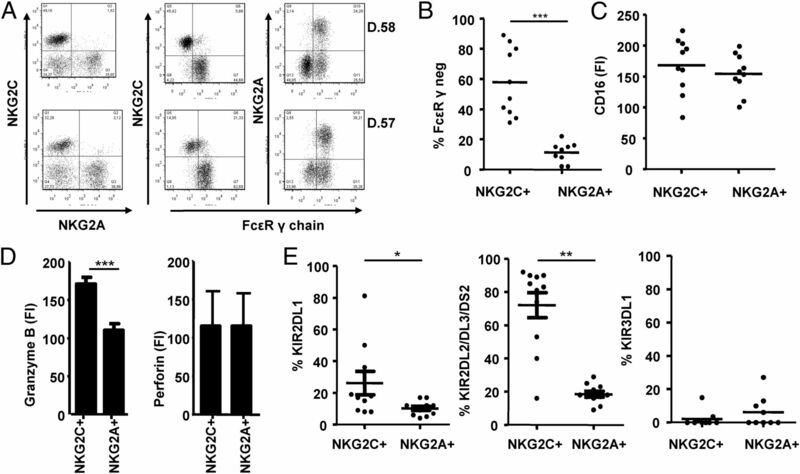 (B) Frequency of FcεR γ-chain–deficient NKG2C+ and NKG2A+ CD56dim NK cells. (C and D) Mean fluorescence index for CD16 surface expression (n = 10), intracellular granzyme B, and Perforin (n = 5) in NKG2C+ and NKG2A+ CD56dim NK cells. (E) Frequencies of KIR2DL1+, KIR2DL2/L3/S2+, and KIR3DL1+ NK cells according to NKG2C+ or NKG2A+ coexpression (n = 10). Data correspond to the mean ± SEM. Statistical significance was calculated by paired Student t test (*p < 0.05, **p < 0.01, ***p < 0.001). We compared the direct and IgG-mediated responses of purified primary NK cells against HCMV-infected MRC5 cells 48 h postinfection. NK cell samples were obtained from HCMV-seropositive blood donors with NKG2Cbright NK cell expansions (donor description in Supplemental Table I). Compared with the low NK cell response against mock-treated and HCMV-infected MRC5, the addition of immune serum triggered the degranulation of a significant fraction of CD56dim NK cells. The degranulation of NKG2C+ and NKG2A+ NK cell subsets in the presence of serum was comparable on average (Fig. 2A–C), although some variability among different donors was noticed (data not shown). Nonetheless, normalization of Ab-dependent versus direct degranulation showed enhanced responsiveness of NKG2C+ NK cells to CD16 activation (Fig. 2D). The presence of serum also triggered the production of TNF-α, already detected after 4 h of stimulation (Fig. 3A, 3B), and of IFN-γ at later stages (Fig. 3C–E). Remarkably, greater proportions of TNF-α+ and IFN-γ+ NKG2Cbright NK cells were consistently detected in all donors in comparison with NKG2C− NK cells (Fig. 3B, 3D, 3E) or the NKG2A+ subset (data not shown). NK cell degranulation against HCMV-infected fibroblasts in the presence of HCMV+ sera. 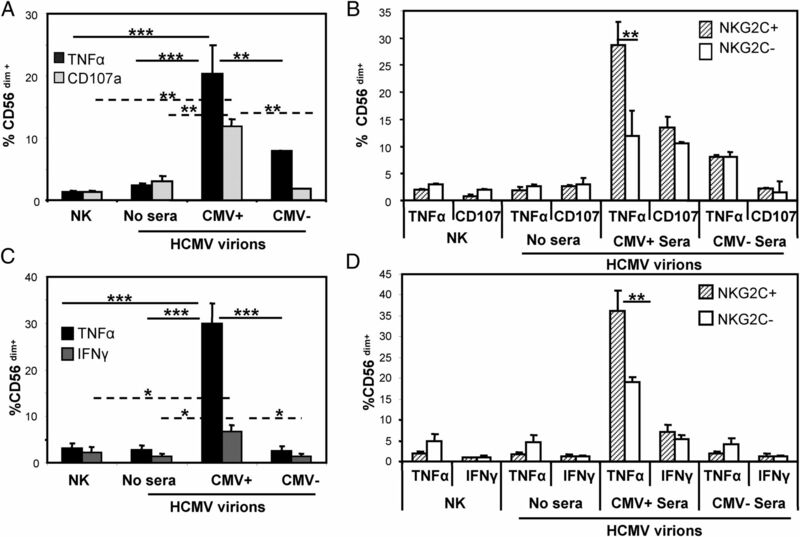 NK cell degranulation against mock-treated and HCMV-infected MRC5 fibroblasts (48 h postinfection) in the presence or absence of HCMV+ or HCMV− sera was analyzed as described in Materials and Methods. NK cell samples were obtained from HCMV+ individuals with expanded NKG2Cbright NK cells. (A) CD107a detection in CD56dim NK cell subsets according to NKG2C expression. Data correspond to a representative donor out of eight analyzed. The proportions of CD107a+ cells referred to total NKG2C+ or NKG2C− cells is indicated. (B) Mean percentage of CD107a+ CD56dim NK cells from different donors (n = 8). (C) Frequencies of CD107a+ cells referred to NKG2C+ or NKG2A+ NK cells (mean ± SEM, n = 8). Statistical significance between conditions was calculated by Student t test, and between NK cell subsets by the paired Student t test. (D) CD107a expression fold difference in NKG2C+ and NKG2A+ NK cells upon coculture with HCMV-infected MRC5 in the presence or absence of immune sera. Statistical significance was calculated by paired Student t test. *p < 0.05, **p < 0.01, ***p < 0.001. NKG2Cbright NK cell production of TNF-α and IFN-γ in response to Ab-coated, HCMV-infected targets. Frequency of TNF-α– and IFN-γ–producing NK cells after 4-h or overnight incubation with mock-treated or HCMV-infected MRC5 cells in the presence of immune sera. NK cell samples were obtained from HCMV+ individuals with expanded NKG2Cbright NK cells. (A and B) Proportions of TNF-α+ NK cells at 4 h referred to the CD56dim subset or to NKG2C expression. (C–E) Proportions of TNF-α+ or IFN-γ+ NK cells at 18 h referred to the CD56dim subset or to NKG2C expression. Data correspond to the mean ± SEM in samples from different donors (n = 5). Statistical significance between conditions was calculated by Student t test, and between NK cell subsets by paired Student t test (*p < 0.05, **p < 0.01). NK cells were left untreated or cultured overnight with IL-2 or IL-15 before measuring cytokine production in response to mock or HCMV-infected MRC5 and specific sera, to address the possible influence of cytokines such as IL-2 and IL-15. Ab-mediated activation of resting primary NK cells triggered the production of TNF-α. Pretreatment with either IL-2 or IL-15 increased the frequency of NK cells secreting TNF-α and promoted the production of IFN-γ. NKG2C+ NK cells always displayed a greater cytokine production in response to Ab-mediated recognition of HCMV-infected cells, regardless of prior cytokine exposure (Supplemental Fig. 1). Immune mechanisms efficiently targeting early steps of HCMV replication are essential for limiting viral dissemination. We performed time-course experiments evaluating the capacity of HCMV-specific Abs to trigger NK cell responses at different times postinfection. NK cell samples were obtained from HCMV+ individuals described in Supplemental Table I to monitor the contribution of NKG2Cbright NK cells. MRC5 cells were cultured with either infective or UV-inactivated virus, and NK cell degranulation was analyzed at 12 or 72 h postinfection in the presence or absence of immune sera (Fig. 4). Direct NK cell degranulation against HCMV-infected MRC5 was similarly low at 12 and 72 h postinfection. Of note, the addition of immune sera elicited NK cell degranulation against HCMV-infected MRC5 as early as 12 h, significantly increasing at 72 h postinfection. The lack of response to MRC5 cells treated with UV-inactivated virus indicated the requirement of an active infection to sustain NK cell–mediated ADCC responses at both time points (Fig. 4A). NKG2C+ NK cell degranulation toward HCMV-infected MRC5 in the presence of immune serum was comparable with that of NKG2A+ NK cells; however, NKG2C+ cells displayed an enhanced Ab-dependent degranulation as indicated by the fold difference in CD107a expression comparing the response against infected MRC5 in the presence or absence of immune serum (Fig. 4B, 4C). NK cell–mediated ADCC against HCMV-infected MRC5 cells at different times postinfection: relationship with HCMV-specific Ab recognition and HLA-I expression. NK cell degranulation against mock-treated, UV-HCMV–treated, or HCMV-infected MRC5 fibroblasts at 12 and 72 h postinfection by the CD107a mobilization assay in the presence of HCMV+ sera. NK cell samples were obtained from HCMV+ individuals. (A) Mean percentage ± SEM of CD107a+ CD56dim NK cells or (B) in relation to NKG2C or NKG2A expression (n = 6); (C) CD107a expression fold difference in NKG2C+ and NKG2A+ NK cells upon coculture with HCMV-infected MRC5 in the presence or absence of immune sera. Statistical significance was calculated using the Student t test between conditions and the paired Student t test between NK cell subsets (*p < 0.05, **p < 0.01, ***p < 0.001). (D) Surface labeling of mock- and HCMV-infected MRC5 at 12 and 72 h postinfection by indirect immunofluorescence with purified IgG from immune (bold line, open histograms) or HCMV− sera (dotted thin lines, open histograms); control including only the secondary Ab (gray profiles). Results of a representative experiment of three performed are shown. (E) Surface HLA-I analyzed by indirect immunofluorescence in mock- and HCMV-infected or UV-HCMV–treated MRC5 cells at 12 and 72 h posttreatment. Results of a representative experiment of four performed are shown. We analyzed in parallel surface HLA-I expression and the binding of IgG purified from immune serum to the infected cell surface by flow cytometry. Binding of HCMV-specific IgG to MRC5 cells was detected at 72 h postinfection, whereas binding to early-infected fibroblasts (12 h) was undistinguishable from the staining with IgG from HCMV− sera (Fig. 4D). In agreement with previous studies, the progressive downregulation of surface HLA-I on MRC5 cells was minimally detected at 12 h and evident at 72 h post HCMV infection (Fig. 4E). CD16-triggered NK cell activation can be regulated by inhibitory receptor coengagement (34). We evaluated the influence of HLA-I in the regulation of ADCC responses against HCMV-infected cells. Blockade of surface HLA-I by a specific mAb (A6/136) increased the basal NK cell degranulation against mock MRC5 and facilitated the Ab-dependent recognition of early infected MRC5 by the NKG2Cbright subset (12 h postinfection; Fig. 5A, 5B). A parallel increase in the frequency of NKG2Cbright TNF-α+ cells was also noticed (data not shown). We next addressed the capacity of HLA-I to regulate anti-HCMV ADCC late responses (48 h postinfection) by using a mutant virus defective for US2, US3, US6, and US11 immunoevasins (HB5-∆US2-11), which inhibit HLA-I expression. The efficiency of MRC5 infection between ∆US2-11 and wild type HCMV was comparable (70–80%) according to IE-1/2 immunostaining (data not shown). As expected, HLA-I surface expression was preserved in MRC5 cells at 48 h postinfection with ∆US2-11 HCMV as compared with cells infected with wild type HCMV (Fig. 5C). Regardless of HLA-I expression levels, HCMV-specific Abs activated a similar NK cell response against infected MRC5 cells (Fig. 5D). Both the percentages and the distribution of NK subsets participating in the cytotoxic response were comparable at 48 (Fig. 5D, 5E) and 72 h postinfection (data not shown). Regulation of Ab-triggered NKG2C+ NK cell degranulation by HLA-I expression on HCMV-infected cells. Ab-induced NK cell degranulation against HCMV-infected MRC5 cells was measured by the CD107a mobilization assay in the presence or absence (NT) of blocking HLA-I Ab (A6/136) at 12 h postinfection. (A) Percentage of CD107a+ CD56dim (B) referred to NKG2C+ NK cells. Data represent the mean ± SEM from three donors. (C–E) MRC5 cells infected with either wild type HCMV or with HB5 ∆US2-11 mutant were used as targets for NK cells in degranulation assays at 48 h postinfection in the presence of immune sera. (C) Surface HLA-I expression in mock- (thin line) or HCMV-infected (bold line) MRC5 cells. (D) Mean percentage of CD107a+ CD56dim NK cell or (E) CD107a+ expression referred to NKG2C+ or NKG2A+ CD56 dim NK cells. Data represent the mean ± SEM from three donors. Statistical significance was calculated using the Student t test (*p < 0.05, **p < 0.01). Altogether, these data show the capacity of HCMV-specific IgG to trigger NK cell responses against newly synthesized viral Ags on infected cells providing the host with a mechanism to control early HCMV reactivation. Surface HLA-I expression hampered Ab-induced NKG2Cbright NK cell activation early postinfection, coinciding with a limited viral Ag expression recognized by immune sera. Progression through the viral cycle led to an enhanced Ab recognition of infected cells capable of overcoming HLA-I expression and viral immunoevasion strategies. CD16+ γδ T cells have been shown to produce IFN-γ when incubated with IgG-opsonized HCMV virions (35). We assessed whether NKG2Cbright NK cells could also respond to viral particles in the presence of specific IgG. Incubation of purified NK cells with HCMV virions (1–2.5 infective viral particles/cell) in the presence of immune sera triggered the production of TNF-α by NKG2Cbright NK cells (Fig. 6 and Supplemental Fig. 2). The percentage of CD107a+ and IFN-γ+ NK cells induced by Ab-virion immune complexes were lower as compared with the proportions of TNF-α+ cells and with the responses against HCMV-infected MRC5 fibroblasts (Figs. 2 and 3). We did not detect the expression of HCMV immediate early protein IE1/2 in NK cells upon their coculture with viral particles (data not shown), confirming the established resistance of lymphocytes to HCMV infection (36, 37).Virus titration experiments showed a dose-dependent NK cell activation, with TNF-α produced in response to as few as 0.08 infective viral particles/cell (Supplemental Fig. 2A). Assays performed in the absence of cytokine priming showed the capacity of nonstimulated NKG2Cbright NK cells to become activated upon recognition of IgG-coated HCMV virions (Supplemental Fig. 2B). Overall, these data revealed a previously unappreciated role for NKG2Cbright NK cells together with Abs in the recognition of HCMV virions. 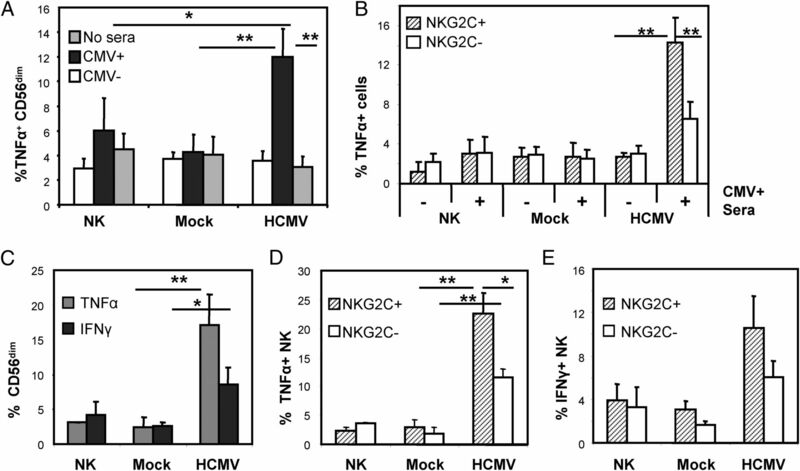 Ab-dependent recognition of HCMV viral particles by NKG2Cbright NK cells. Degranulation, TNF-α, and IFN-γ production by purified NK cells cultured for 5 h or overnight with HCMV virions in the presence or absence of HCMV+ and HCMV− sera. Frequency of CD107a+ and TNF-α+ in response to HCMV virions in relation to CD56dim NK cells (A and C) or NKG2C+ NK cells (B and D) after 5 (A and B) or 18 h (C and D). Mean ± SEM data from three (5 h) and six (18 h) independent donors are respectively shown. Statistical significance was calculated using the Student t test between conditions and the paired Student t test between NK cell subsets (*p < 0.05, **p < 0.01, ***p < 0.001). Our previous results highlight the intrinsic capacity of NKG2Cbright NK cells to produce greater TNF-α and IFN-γ levels upon CD16 activation compared with NKG2C− or NKG2A+ NK cell subsets. We addressed whether the presence of the NKG2Cbright NK cell subset would condition the overall magnitude of the Ab-induced NK cell cytokine production. For that purpose, we selected two groups of four HCMV+ donors displaying or not NKG2Cbright NK cells and compared the cytokine response induced by rituximab-coated 721.221 cells. The average frequency rate of NKG2C+ NKG2A− NK cells in the four donors displaying NKG2Cbright NK cell expansions was 48% (range 34–61%). HCMV+ donors lacking NKG2Cbright expansion had an average of 13% undifferentiated NKG2Cdim NK cells (range 6–16%; Fig. 7A, 7B) (30). Samples from HCMV+ individuals with NKG2Cbright NK cell expansions secreted larger amounts of TNF-α and IFN-γ in response to rituximab-coated 721.221 cells than those from HCMV+ subjects lacking this cell population (Fig. 7C). Intracellular cytokine analysis confirmed the larger frequency of TNF-α+ and IFN-γ+ NK cells in samples displaying NKG2Cbright NK cell expansions (Fig. 7D), as well as the predominance of this NK cell subset in the rituximab-dependent response against 721.221 cells (Fig. 7E). Notably, NKG2Cbright NK cells also displayed enhanced TNF-α and IFN-γ responses upon CD16-independent stimulation with PMA and ionomycin. As a consequence, the overall cytokine secretion was greater in NK cell samples from donors with expanded NKG2Cbright NK cells (Supplemental Fig. 3). Comparison of Ab-induced TNF-α and IFN-γ secretion by NK cells from HCMV+ individuals in relation to the presence of NKG2Cbright NK cell expansions. Purified NK cells from HCMV+ donors with or without NKG2Cbright NK cell expansions were incubated overnight with rituximab-coated 721.221 cells. (A and B) Distribution of the NK cell repertoire according to NKG2C and NKG2A expression in donors with (NKG2Cbright) or without (NKG2Cdim) expanded NKG2Cbright NK cells. (C) Secreted TNF-α and IFN-γ measured by ELISA in samples from donors with (+) or without (−) NKG2Cbright NK cell expansions. Bar graphs (D) and dot plots (E), respectively, display the mean proportions of TNF-α+ and IFN-γ+ cells by ICCS analyzed by flow cytometry. Insets indicate the percentages of NKG2C+ and NKG2C− cells positive for each cytokine. Bar graphs display the mean ± SEM values summarizing data from four donors. Statistical significance was calculated by Student t test (*p < 0.05, **p < 0.01). Thus, the expansion of NKG2Cbright NK cells in HCMV+ subjects determined the magnitude of the proinflammatory cytokine response upon Ab-dependent and -independent NK cell activation. The association between HCMV infection/reactivation and the expansion of NKG2Cbright NK cells is well established; however, key questions such as the mechanisms governing their differentiation and their contribution to the antiviral response remain unanswered. Recently, the possible role of NKG2C+ NK cells as Ab-dependent effectors was outlined (29). We have used primary polyclonal NK cells from healthy HCMV+ volunteers displaying NKG2Cbright NK cell expansions to characterize their response (i.e., CD107a, TNF-α, and IFN-γ) upon Ab-dependent recognition of HCMV-infected MRC5 fibroblasts. Our data reveal three complementary and relevant aspects of the HCMV-specific Ab-mediated NK cell response: 1) the robustness and sensitivity of this antiviral mechanism capable of recognizing HCMV-infected cells from early to late stages of the HCMV replicative cycle, overcoming the inhibition mediated by self–HLA-I expression and viral immunoevasion strategies; 2) the intrinsic capacity of NKG2Cbright NK cells to efficiently secrete TNF-α and IFN-γ upon Ab-dependent activation, influencing the overall proinflammatory and antiviral response in HCMV+ individuals; and 3) the ability of NK cells, particularly the NKG2Cbright subset, to recognize and respond to cell-free HCMV particles in the presence of specific Abs. Few studies have evaluated the capacity of Abs produced along the anti-HCMV immune response to prevent viral replication by triggering NK cell–mediated recognition of HCMV-infected cells (38, 39), despite previous evidences showing the contribution of NK cell–mediated ADCC to the control of other viruses (e.g., HIV and influenza) (40–44). Our study demonstrates that anti-HCMV Abs in immune sera can trigger an effective NK cell activation exceeding the low natural cytotoxicity levels against infected MRC5 cells. HCMV-specific Abs were capable of triggering NK cell–mediated ADCC against fibroblast infected with a low MOI (0.7) as early as 12 h postinfection and progressively increased along the HCMV cycle. Thus, this constitutes a sensitive antiviral mechanism potentially important for detecting early reactivation and limiting viral dissemination. It is worth mentioning that NK cell–mediated recognition of autologous HCMV-infected monocyte-derived dendritic cells (moDCs) was also superior in the presence of Abs. However, the requirement of using a high MOI resulted in the detection of HCMV Ags on the DC surface independently of the infectious process, as supported by the comparable staining and the elevated Ab-mediated NK cell degranulation induced by immune sera toward HCMV-infected or UV-HCMV–treated moDCs (data not shown). This fact precluded using autologous moDCs for the analysis of NK cell–mediated ADCCs against newly synthesized viral Ags in the infected cell. Our data indicate that NK cell–mediated ADCC responses are capable of overcoming HCMV evasion strategies. Early postinfection, the blockade of HLA-I by an mAb capable of interfering with HLA-I–KIR interaction enhanced NKG2Cbright NK cell degranulation, indicating that KIR2DL could negatively regulate CD16-dependent NK cell activation in situations of limited stimulation. Yet, as indicated by experiments infecting with ∆US2-11 HCMV, surface HLA-I had no influence on the Ab-induced NK cell response against infected MRC5 at later times postinfection (48–72 h), coinciding with an enhanced recognition of infected cells by IgG in immune sera. In this regard, the HLA-C*07:02 allele expressed in MRC5 has been shown to be refractory to the action of gpUS2 and gpUS11, remaining at the infected cell surface for prolonged times postinfection and precluding direct KIR2DL2/3+ NK cell responses against HCMV-infected MRC5 (45). The majority of viral evasion molecules devoted to avoid NK cell recognition of HCMV-infected cells are expressed with late kinetics in the HCMV replicative cycle (46). According to our data, the effect of these immunoevasins was bypassed by Ab-mediated NK cell activation, yet we did not directly address their capacity to influence ADCC. Moreover, in our experimental system, immune sera were capable of triggering NK cell activation against infected cells despite the possible interference by gp34 and gp68 HCMV Fc-binding proteins (47, 48). Coincident results are seen using cells infected with HSV-1, also encoding a decoy FcγR (M. Moraru, L.E. Black, A. Muntasell, F. Portero, M. López-Botet, H.T. Reyburn, J.P. Pandey, and C. Vilches, manuscript in preparation). Identification of the viral Ags targeted by the humoral response on the infected cell surface at different time points remains an unmet goal that could provide information to rationally improve vaccination strategies. Whether and to what extent antigenic breadth, relative Ab titers, and dominance of particular isotypes are NK cell–extrinsic factors influencing the magnitude and quality of Ab-mediated NK cell responses, and thus the benefits of passive anti-HCMV Ig treatments, deserve attention. The monitorization of several NK cell effector functions showed the ability of NKG2Cbright NK cells to degranulate and particularly to dominate the production of TNF-α and IFN-γ in response to Ab-mediated stimulation. Remarkably, NKG2Cbright NK cells not only showed greater Ab-driven cytokine secretion, but also produced higher levels of TNF-α and IFN-γ upon CD16-independent activation. Thus, NKG2Cbright NK cells appeared particularly suited for cytokine production upon activation. Indeed, recent studies have pointed toward epigenetic imprinting in HCMV-differentiated and functionally competent NK cells as a mechanism regulating their proinflammatory cytokine program (49, 50). In contrast, the average degranulation of NKG2Cbright NK cells against HCMV-infected targets in the presence of specific Abs was comparable with the proportion of degranulating NKG2A+ NK cells, despite their greater responsiveness to CD16-dependent activation and the accumulation of FcεR γ-chain–deficient cells (51). Accordingly, the cytolytic potential of NK cell samples from donors containing or not NKG2Cbright NK cell expansions against rituximab-coated 721.221 cells was comparable as assessed by the calcein-AM release method (data not shown). Yet, it cannot be ruled out that their different granzyme B levels might determine more subtle differences in NKG2Cbright killing capacity. Thus, two separate mechanisms may account for NKG2Cbright NK cell functional specialization: 1) differentiation-driven epigenetic modifications on cytokine loci as regulators of their effector program; and 2) downregulation of NCR surface expression and CD3ζ-preferential coupling to CD16, associated to FcεR γ-chain loss. Certain heterogeneity in the differentiation of the NKG2Cbright NK cell subset is illustrated by the variable expression of CD57 or LILRB1 (16, 30). Further studies are required to delineate the sequence of events leading to cytokine-producing NKG2Cbright NK cells and the relation with FcεR γ-chain loss. Of note, NKG2Cbright NK cell expansions, as well as their dominance in the Ab-dependent cytokine response, was observed in individuals with different CD16 (158V/F) genotypes regardless of their reported influence on Ab binding and Ab-mediated ADCC (52, 53). Whether the frequency of NKG2Cbright NK cells, not appreciated through genetic analysis, could explain the controversial data in studies addressing the impact of those polymorphisms in clinical contexts such as Ab-based anticancer therapies deserves attention (54). Finally, it is conceivable that factors modulating the HCMV-induced redistribution of the NK cell compartment, such as the NKG2C gene dose (30), could condition the overall proinflammatory cytokine secretion in HCMV-seropositive adults in different contexts. A previously unappreciated aspect of the cooperation between NKG2Cbright NK cells and HCMV-specific Abs is the sensing of cell-free Ab–virion complexes. In close resemblance, HCMV-induced γδ T cells secrete IFN-γ in response to IgG-opsonized virions (35). We previously reported that NK cells may directly sense HCMV through a TLR2-dependent mechanism (55). Our data demonstrate that HCMV-specific Abs promote a specific and sensitive NKG2Cbright NK cell–mediated sensing of HCMV. Interestingly, NK cell responses triggered upon the recognition of Ab-coated viral particles were skewed toward the production of TNF-α, rather than IFN-γ or degranulation, in contrast with their activation against Ab-coated cell targets. It has been shown that NK cell cytotoxicity and IFN-γ secretion in response to IgG stimulation is particularly dependent on LFA-1 engagement as opposed to TNF-α production (32, 34). The absence of simultaneous coengagement of LFA-1 together with CD16 by Ab–HCMV complexes presumably explains the predominance of TNF-α. TNF-α secretion by NKG2Cbright NK cells could presumably take place in different processes involving Ab-opsonized intracellular or extracellular pathogens, toxins, or autoantigens. It is tempting to speculate that a systemic proinflammatory environment sustained by NKG2Cbright NK cells could underlie the described association between the frequency of NKG2C+ NK cells, elevated C-reactive protein levels, and high-risk carotid plaques in HCMV+ patients (56). In summary, our data demonstrate that the cooperation between anti-HCMV serum Abs and NK cells constitutes a powerful antiviral effector mechanism. NKG2Cbright NK cells appear as a developmentally distinct subset, contributing to HCMV control through their cytotoxic potential and the production of TNF-α and IFN-γ upon Ab-mediated stimuli. We are grateful to Esther Menoyo for collaborating in obtaining blood samples, Dr. Oscar Fornas for advice in flow cytometry, and volunteer blood donors for participation. ↵1 A.M. and M.L.-B. share credit for senior authorship. This work was supported by the Plan Estatal de Investigación Científica (SAF 2013-49063-C2), the European Regional Development Fund through the Ministry of Economy and Competitiveness, the Fundació La Marató TV3 (Grant 121531), the Red Española de Esclerosis Múltiple, the European Regional Development Fund through Instituto de Salud Carlos III (Grant RD12/0032/0016), and the Fundación Asociación Española Contra el Cáncer (to A.M.). 2000. Cytomegalovirus. In Mandell, Douglas, and Bennett's Principles and Practice of Infectious Diseases, 5th Ed., Vol. 2. Mandell G. L.Bennet J. E.Dolin R., eds. Churchill Livingstone, Philadelphia, p. 1586–1599.
. 2009. How we treat cytomegalovirus in hematopoietic cell transplant recipients. Blood 113: 5711–5719. 2007. Infection in solid-organ transplant recipients. N. Engl. J. Med. 357: 2601–2614.
. 2006. Congenital cytomegalovirus infection following first trimester maternal infection: symptoms at birth and outcome. J. Clin. Virol. 35: 216–220.
. 2011. Role of CMV in immune senescence. Virus Res. 157: 175–179.
. 2011. Association of atherosclerosis with expression of the LILRB1 receptor by human NK and T-cells supports the infectious burden hypothesis. Arterioscler. Thromb. Vasc. Biol. 31: 2314–2321.
. 1999. Natural killer cells in antiviral defense: function and regulation by innate cytokines. Annu. Rev. Immunol. 17: 189–220.
. 2005. Natural killer cells utilize both perforin and gamma interferon to regulate murine cytomegalovirus infection in the spleen and liver. J. Virol. 79: 661–667.
. 1999. Natural killer cell activation and inhibition by receptors for MHC class I. Curr. Opin. Immunol. 11: 301–307.
. 2004. Killer immunoglobulin-like receptors. Curr. Opin. Immunol. 16: 626–633.
. 2000. Down-regulation of MHC class I antigen presentation by HCMV; lessons for tumor immunology. Immunol. Invest. 29: 97–100.
. 2004. Natural killer cell receptors for major histocompatibility complex class I and related molecules in cytomegalovirus infection. Tissue Antigens 63: 195–203.
. 2013. Adaptive reconfiguration of the human NK-cell compartment in response to cytomegalovirus: a different perspective of the host-pathogen interaction. Eur. J. Immunol. 43: 1133–1141.
. 2014. Human cytomegalovirus infection promotes rapid maturation of NK cells expressing activating killer Ig-like receptor in patients transplanted with NKG2C-/- umbilical cord blood. J. Immunol. 192: 1471–1479.
. 2010. Influence of human cytomegalovirus infection on the NK cell receptor repertoire in children. Eur. J. Immunol. 40: 1418–1427.
. 2012. Influence of congenital human cytomegalovirus infection and the NKG2C genotype on NK-cell subset distribution in children. Eur. J. Immunol. 42: 3256–3266.
. 2013. Human cytomegalovirus-induced NKG2C(hi) CD57(hi) natural killer cells are effectors dependent on humoral antiviral immunity. J. Virol. 87: 7717–7725.
. 2013. NKG2C zygosity influences CD94/NKG2C receptor function and the NK-cell compartment redistribution in response to human cytomegalovirus. Eur. J. Immunol. 43: 3268–3278.
. 2006. Synergy among receptors on resting NK cells for the activation of natural cytotoxicity and cytokine secretion. Blood 107: 159–166.
. 2010. Regulation of human NK-cell cytokine and chemokine production by target cell recognition. Blood 115: 2167–2176.
. 2008. Simple genotyping of functional polymorphisms of the human immunoglobulin G receptors CD16A and CD32A: a reference cell panel. Tissue Antigens 71: 242–246.
. 2012. Antibody-dependent anti-cytomegalovirus activity of human γδ T cells expressing CD16 (FcγRIIIa). Blood 119: 1418–1427.
. 1984. Cytomegalovirus infects human lymphocytes and monocytes: virus expression is restricted to immediate-early gene products. Proc. Natl. Acad. Sci. USA 81: 6134–6138.
. 2008. Cytomegalovirus cell tropism. Curr. Top. Microbiol. Immunol. 325: 63–83.
. 2001. Antibody inhibition of cytomegalovirus: the role of natural killer and macrophage effector cells. Transpl. Infect. Dis. 3(Suppl. 2): 31–34.
. 2004. Antiviral activity against CMV-infected fibroblasts in pediatric patients transplanted with CD34(+)-selected allografts from alternative donors. Hum. Immunol. 65: 423–431.
. 2001. Evidence for a correlation between antibody-dependent cellular cytotoxicity-mediating anti-HIV-1 antibodies and prognostic predictors of HIV infection. J. Clin. Immunol. 21: 227–233.
. 2012. Antibody-dependent cellular cytotoxicity and NK cell-driven immune escape in HIV infection: implications for HIV vaccine development. Adv. Virol. 2012: 637208.
. 2012. HIV-specific antibodies capable of ADCC are common in breastmilk and are associated with reduced risk of transmission in women with high viral loads. PLoS Pathog. 8: e1002739.
. 2013. Identification of dominant antibody-dependent cell-mediated cytotoxicity epitopes on the hemagglutinin antigen of pandemic H1N1 influenza virus. J. Virol. 87: 5831–5840.
. 2014. Influenza-specific antibody-dependent cellular cytotoxicity: toward a universal influenza vaccine. J. Immunol. 193: 469–475.
. 2013. Presentation of an immunodominant immediate-early CD8+ T cell epitope resists human cytomegalovirus immunoevasion. PLoS Pathog. 9: e1003383.
. 1999. DNA microarrays of the complex human cytomegalovirus genome: profiling kinetic class with drug sensitivity of viral gene expression. J. Virol. 73: 5757–5766.
. 2004. Herpesviral Fcgamma receptors: culprits attenuating antiviral IgG? Int. Immunopharmacol. 4: 1135–1148.
. 2014. Human cytomegalovirus Fcγ binding proteins gp34 and gp68 antagonize Fcγ receptors I, II and III. PLoS Pathog. 10: e1004131.
. 2014. Human NK cells licensed by killer Ig receptor genes have an altered cytokine program that modifies CD4+ T cell function. J. Immunol. 193: 940–949.
. 2014. Human cytomegalovirus drives epigenetic imprinting of the IFNG locus in NKG2Chi natural killer cells. PLoS Pathog. 10: e1004441.
. 2007. Increased natural killer cell expression of CD16, augmented binding and ADCC activity to rituximab among individuals expressing the FcgammaRIIIa-158 V/V and V/F polymorphism. Blood 110: 2561–2564.
. 1997. Fc gammaRIIIa-158V/F polymorphism influences the binding of IgG by natural killer cell Fc gammaRIIIa, independently of the Fc gammaRIIIa-48L/R/H phenotype. Blood 90: 1109–1114.
. 2013. A critical review of the role of Fc gamma receptor polymorphisms in the response to monoclonal antibodies in cancer. J. Hematol. Oncol. 6:1–6.
. 2013. Priming of NK cell anti-viral effector mechanisms by direct recognition of human cytomegalovirus. Front. Immunol. 4: 40.
. 2013. Expansion of the NKG2C+ natural killer-cell subset is associated with high-risk carotid atherosclerotic plaques in seropositive patients for human cytomegalovirus. Arterioscler. Thromb. Vasc. Biol. 33: 2653–2659.